I love banana bread. I love zucchini bread. I love chocolate chips. And I really love the Chocolate Chip Zucchini Banana Bread I baked the other night. I’m not sure where the idea to combine zucchini and banana came from, but I was determined to make it happen. I Googled recipes and found quite a few highly rated ones that looked pretty good. But all the recipes I found called for a lot of sugar, and the most I wanted to use was 1/2 cup. After scanning recipe #5, a light bulb went off in my head, and I remembered the AMAZING Chocolate Chip Banana Bread recipe I posted on MIS! A recipe that only uses 1/2 a cup of sugar. Now I was getting somewhere! I looked at the recipe, made a few adjustments, and crossed my fingers that it would turn out ok. Thankfully, it turned out better than expected! 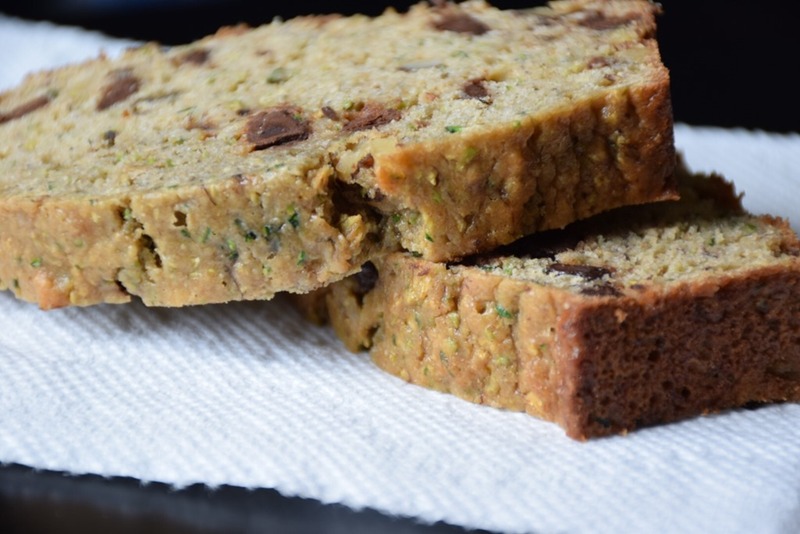 The combination of zucchini, banana, chocolate chips, walnuts, coconut oil, and vanilla extract creates a dense, delicious, perfectly sweet bread that everyone will love. And for those of you who are hesitant about adding veggies to your baked goods, I PROMISE you can’t taste the zucchini at all! My favorite part? I love the chocolate chips and walnuts studded throughout. I also love the texture of this bread. I know this sounds strange, but it has a melt-in-your-mouth creaminess to it. And I’m not the only fan. Vishnu loves it too. In fact, he’s already inquired about loaf #2! This bread needs to be on your to make list. Ok? Ok! 3. In a separate bowl, beat eggs and then add coconut oil, banana, zucchini, and vanilla extract. 4. Pour wet ingredients into dry and mix well. 5. Fold in chocolate chips and walnuts until evenly distributed in batter. 6. Pour batter into well greased loaf pan. 7. Bake for 50 minutes. 8. Allow to cool, slice, and enjoy! And have a wonderful Friday and long weekend. Well, for those of us in the States at least! Mmm this recipe looks wonderfully moist! I’m such a fun of banana bread and if it sneaks in a dose of veggies without affecting the taste, I’m all for it! Definitely saving this for a rainy day. I seem to be buying more bananas than I can finish lately so at least now I can put them to use before they go off completely ;)! You will LOVE this recipe, K! It’s so delicious! Yum, this looks perfect for a healthy snack! I’m with you on using less sugar in recipes. Totally! And you don’t even miss the sugar! YUM! This would be sooo good with a cup of coffee. It’s happening. This weekend. Let me know if/when you make it! 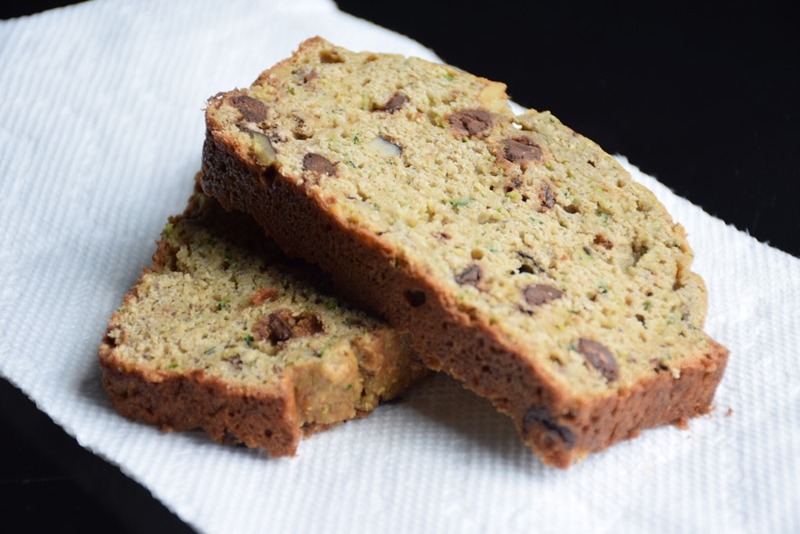 I love anything with chocolate chips and zucchini bread, so this is a winning combination! Now I just need to go get myself some zucchinis 🙂 Thanks for sharing! It’s so good, Carly! Let me know if/when you make it! It’s perfection with a cup of coffee! So so good! Did you make it? Let me know when you do! So proud of YOU for making not one but TWO loaves! Go momma! So true. Chocolate literally makes everything better! yes and yes to all of the above ingredients. I am not surprised that they didnt last very long. I made a second loaf over the weekend and it lasted a whole 20 hours before it was gone! So good! i just made this into muffins and they were great! Ate 2 right out of the oven! Thanks for the recipe. Oh so glad you liked it! I’m going to have to try this out in muffin form. May help with portion control! woahhh I’ve never seen a banana AND zucchini bread recipe! Yum!! You’d love this, Liz! Totally up your alley! It’s soo good! Let me know when you try it out! This bread sounds so good! Definitely pinning it to make on my day off… which will be in about 11 days! haha. It’s the perfect thing to make on your day off! Let me know when you try it!